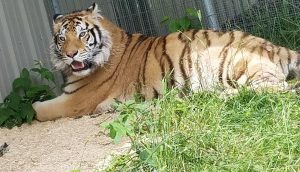 Home » Amazing medical progress for tigers Daisy and Mohan! What a difference a couple of months can make for two very ill tigers! When we picked up Mohan, he had such difficulty walking. With degenerative joint disease of the knees due to untreated cranial cruciate ligament injuries and with nails grown so long they’d embedded in his front paws, walking was so painful. Look at him now, though – playing with toys, climbing up on his perch! Thanks to diagnostics at the University of Minnesota, a pain management and mobility program, and trimmed paws, you can see the difference already. 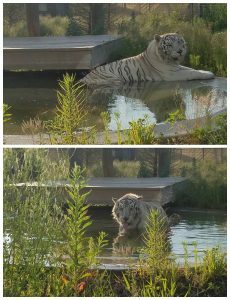 Seeing moments like these, with him lounging in his pool or on his perch enjoying a sunset….well, it’s really quite remarkable. Even after rescuing so many, each one is special. 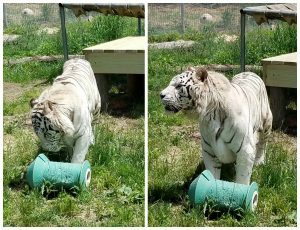 Mohan’s a very sweet boy and we hope he has many more years ahead of him to enjoy living wild at heart here at TWS. Just like Mohan, this week with Daisy has been pretty amazing, too! As you recall, Daisy recently arrived with a neurological disorder, causing hind-end ataxia (the loss of full control of bodily movements) and pain. She had good days and bad, but on the bad days, she couldn’t even get up. 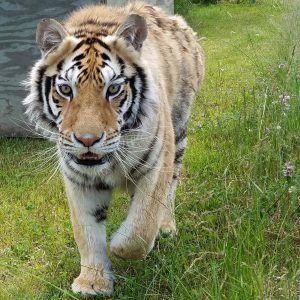 We brought her to the University of Minnesota Veterinary Medical Center for critical diagnostics as soon as she arrived at TWS. That visit included a CT scan and full exam, but still didn’t provide answers to our questions. This second visit consisted of radiographs, muscle testing, a spinal tap and more blood work. Results are still pending, but we do know there is an inflammatory response in the lower back that’s causing her discomfort and issues. A new medical plan was developed for her while we await more test results. We’re excited to already see such a good response with this plan! She’s up and moving!! Daisy’s playing and even relaxing in her small pool. How different from the days she could barely stand up! Just how small is Daisy? It’s hard to understand how stunted her growth is without seeing some sort of comparison. 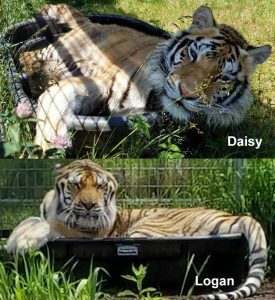 I remembered we had a picture of Logan playing in his trough when I saw Daisy doing the very same thing this week. So, I thought it might be a way to show you the difference. While Logan’s spilling out of the trough and can barely squeeze in, Daisy fits in it with room to spare! At 2.5 years old, we hope Daisy will have a long life ahead of her. But we know the road won’t always be easy and her care will be expensive – and it sure has been so far!! But giving Daisy the life she deserves, is so worthwhile. We know you think so, too.